Is it wrong to cry over koi? Well, I did last night when I came home to the news that my husband found our prized koi (prized by us) floating on the pond. And I shed a few tears. Of all the fish we have (13) she was special. We’d had her since 2001, one of three, 3-4″ koi fish we bought at a local pond supply. She was beautifully marked in red and white. We didn’t know at the time she was a girl – but we named her Ichiban, Japanese for ‘number one.’ She reigned supreme as the queen of the backyard. https://delawaregardener.wordpress.com/2013/05/23/ponds/ As the koi grew, they became accustomed to our habits and movements and Ichiban was the one that always approached us at pond’s edge, let us pet her on the side and after a short amount of training, ate trustingly from our hands. She was a show stopper and a performer. After two seasons of being well fed, she grew gregarious and had a friendly, if not curious personality. She’d spy us and swim over, her mouth opening and closing. “Feed Me! Feed Me!” she seemed to say. When we had to replace a pond liner a few years ago, she didn’t fight the net and calmly let us transfer her to a temporary pool – one where we could pet her with ease. 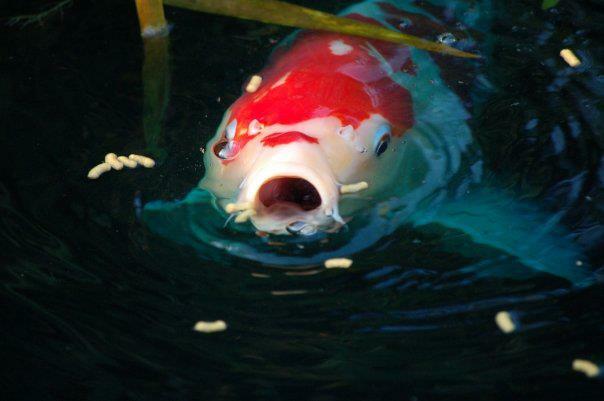 When we added a butterfly koi around 2009 or so, her behavior changed to that of a spawning female. She’d race around the pond, thrashing, side to side, and flipping in the air, sort of playing hard to get, or so it seemed to us. 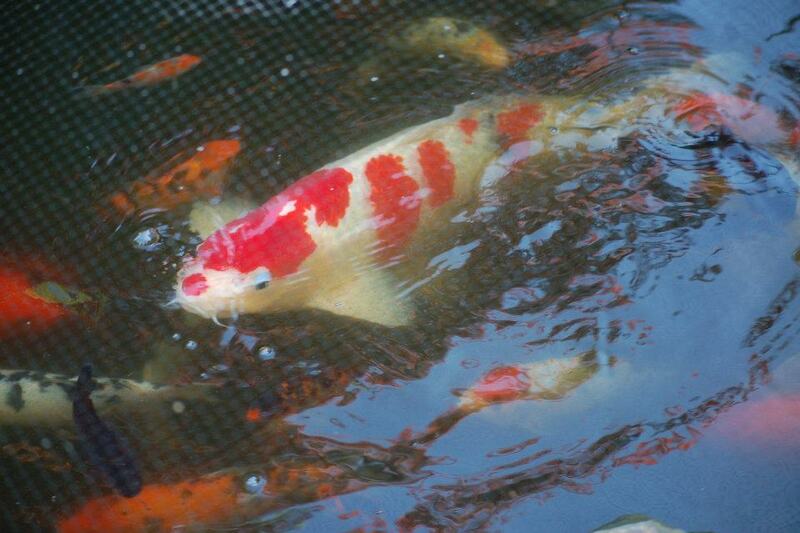 Ichiban was one of our original four koi we bought in 2002. She is very friendly, lets us pet her and feed her. She is a piggy and a show off! 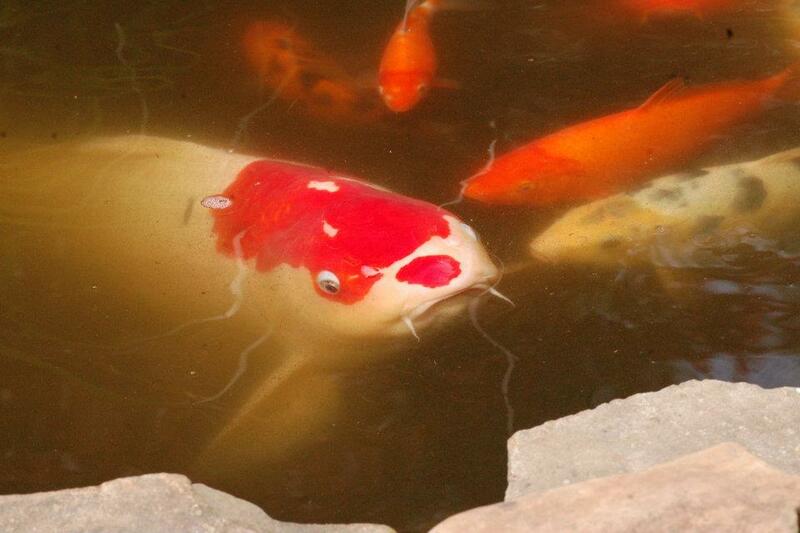 We knew little of the game of koi courtship. We had a lot of plants in the pond that year. By the end of the summer, we found many new baby koi with Ichiban’s markings along with swishy, graceful butterfly tails. We always have had to fight off predators.Southern Delaware has an abundance of waterways, but Blue Herons nevertheless found our small patch of water irresistable. In 2013, we bought a dozen or so copper shepherds hooks and placed them around the pond – this allowed a net to be stretched across the entire length and width of the pond and raised up 8 ” or so off the surface of the water. Each year, as temperatures cooled, we watched all the fish begin to huddle together in the deepest section of our pond, about 5 feet deep, and there they’d reliably stay until the warmth of spring called them back to us. Ichiban was always the first to feed and always the one that got the most chow. We don’t know what happened to her. She did not seem to want to hibernate this year and came up to the surface often during the odd warm spell. We also had our coldest winter, and like all winters in the past, we ran a warming stone that floated on the surface. We found her coming up to that several times and then go back down. She appeared confused. Confusion, something internal, we don’t know – the snow and ice and collected leaves lowered down to the water’s surface. We’re not entirely sure, but we think she came up during a warm spell (in the 40 degrees) and the net might have stopped her from returning back down. We found her, and one of her pretty offspring lifelessly floating together. It is natural to love our pets and grieve over them like family. Ichiban wasn’t exactly like a cat or dog, or horse – but we had a relationship with her. Unlike the other fish, she had a personality, or we attributed one to her. For 14 years she entertained us. We had a bond. Our pond had a personality. At pond’s edge. Feed me!